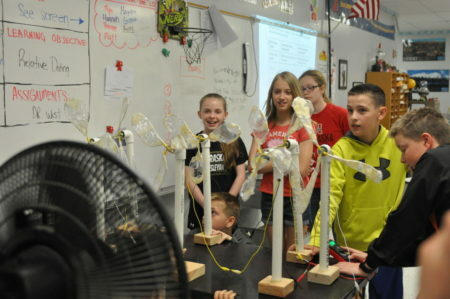 Beatrice Middle School students watch their handmade wind turbine models in action. Sixth graders in Beatrice and Nebraska City made the turbines through the Science Literacy Initiative of the Institute for Agriculture and Natural Resources of the University of Nebraska-Lincoln. “The project’s goal is to help students learn about renewable energy using STEM concepts,” [Beatrice Middle School science teacher Derek Niss] said, referring to the acronym for science, technology, engineering and mathematics. Read the entire article here. This entry was posted in Nebraska / Midwest News, NewsBlog and tagged Beatrice & Nebraska City, Beatrice Daily Sun, renewable energy education in Nebraska, Science Literacy Initiative, UNL's Institute for Agriculture and Natural Resources on May 19, 2016 by Helen Deffenbacher.